Frog Find 1.0 is here for FREE! Update: The wait is over. Go get the app here at no charge! And for those who missed our launch event, please read this post by Dr. Gururaja! Gubbi Labs is proud to launch an android app, "Frog Find 1.0" " that helps to identify frogs and toads of the Western Ghats. This is based on our popular publication, 'Pictorial Guide to Frogs and Toads of the Western Ghats' by Dr. K. V. Gururaja published last year. This monsoon, you can use this app to venture in the field and use this interactive app on your mobile phone. 27th April is now annually observed as 'Save the Frogs' day! 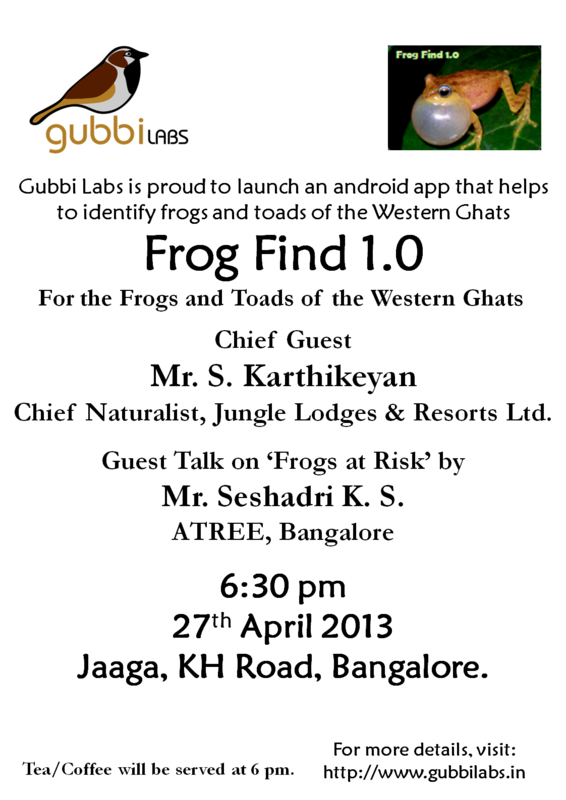 We are happy to launch the app on 27th April 2013 coinciding with Save the Frogs Day at Jaaga, Bangalore. Mr. S. Karthikeyan, Chief Naturalist with Jungle Lodges and Resorts Ltd. and a very well known name in the conservation circles of Bangalore has graciously agreed to launch this app. We are also happy that Mr. Seshadri KS from ATREE is also going to give a talk on 'Frogs at Risk' based on their recent work and poster on frogs in Bangalore. Check out the invite below: Developers Harish Shanthi Kumar, Ashwin Murugesh and Vinay Varma PK came forward to develop an android app based on Dr. KV Gururaja's book. They are going to be there and share the story of the app after the launch. We are happy to invite you to the launch event at Jaaga this Saturday, 27th April 2013. We look forward to your presence during the launch! Details on getting app will be made available on our website after the launch.